I'm Andy Walker from Edmond, OK, and I have been a Tiger owner since 1979. Prior to that, however, I was a major-league HO slot car enthusiast, being introduced to that hobby in 1967 when I received my first Aurora HO scale racing set for Christmas at the age of 7. Up until the time when I got my driver's license and got into real cars, I had amassed more track and more slot cars than I knew what to do with, and I still have all of that stuff to this day. I had always loved British sports cars and Fords, which led to the purchase of my first Tiger just after my 19th birthday in September of '79. 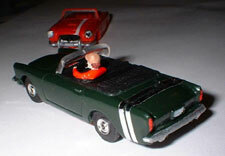 Although I became heavily involved in all things Rootes at that point, I never lost my interest in the little HO cars. I was interested in building a replica of my Tiger in HO scale but, having tried custom-building HO scale slot cars before with somewhat limited success, I knew I didn't have the talent to get it done. 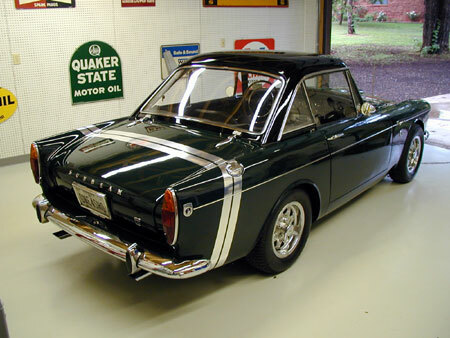 In mid-February '03, I was perusing the "Sunbeam Tiger" page on eBay when I saw an auction for a resin-bodied Sunbeam Tiger HO scale "T-Jet" ("Thunderjet" Aurora slot car, for those not indoctrinated in such things...) slot car. True enough, it did not sport the side trim or badges but, hey, it's in HO scale and small items like that are very hard to replicate. Overall, however, it looked very faithful to the marque. 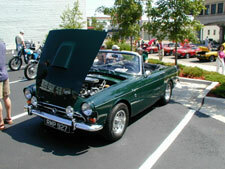 I contacted the seller/manufacturer of the car to see if he could custom-build a replica of my car in Forest Green. I also inquired about replicating the LAT 58 tail stripes in hopes that could do those as well. He returned my E-mail immediately and asked me to send him a couple of pics of my Tiger, which I promptly did. The next day when I got home from work, I checked my E-mail. Sure enough, I had an E-mail from this guy. I figured he was going to tell me it was either going to be too tough to do or would be too expensive but, to my surprise, there was an attachment on the e-mail. I opened it only to see what I had been looking for all these years...an actual HO scale replica of my Tiger, complete with the LAT 58 tail stripes! I couldn't believe that he had gotten it so right so quickly! I was also delighted to find out that the car came complete with a running T-Jet chassis! If there are any other HO scale slot car enthusiasts on this list who like what you see and might like a replica of their Tiger, feel free to contact me and I will put you in touch with the builder. Take care and Happy Tigering! !